ABB has launched an updated maritime software analytics platform that brings together the company’s EMMA and OCTOPUS applications into one software suite, under the banner OCTOPUS. Now external information, such as weather or cargo load parameters, can be combined with the ships process and propulsion information. OCTOPUS acts as a digital hub for vessel data that can improve efficiency across a whole fleet and it can gather an unlimited amount of signals from onboard sensors. 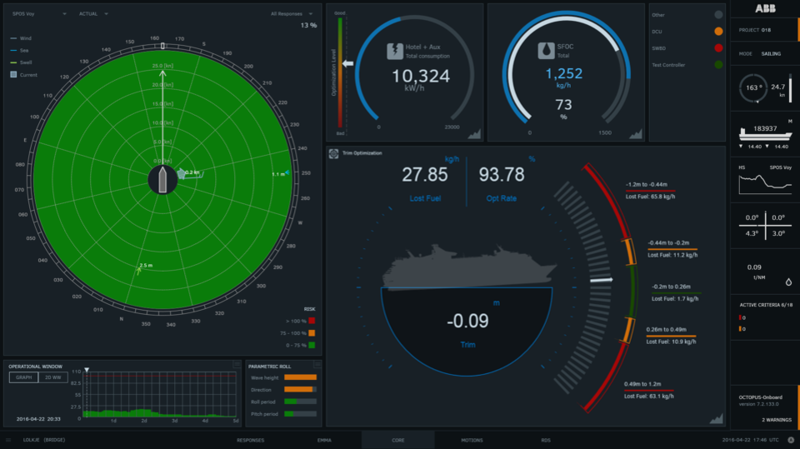 The shipping industry is benefitting from increased connectivity with smart sensors able to transmit performance data to shore. The digitalization of shipping has led to stronger shore side operations with ABB working with companies to raise efficiency of daily operations and service. ABB manufactures hardware with sensors and many of the measuring instruments that feed information to OCTOPUS. ABB has already offered a transformed approach to service and dry-dockings through its Integrated Operations concept as a way of operating that allow ships, onshore operations and ABB to operate on the same information and communication technology backbone. “ABB has been quick to recognize the important role digitalization and software have to play in the shipping industry and OCTOPUS has been deployed on a variety of ship types, helping vessels to operate more safely and efficiently,” said Juha Koskela, Managing Director of ABB’s Marine and Ports business. OCTOPUS is currently installed on more than 400 vessels and the newly expanded version is expected to increase its appeal. On the same platform users can access a range of information including data about a vessels trim, bunker transfer, fuel consumption, power plant optimization, electricity use, speed advice, propulsion power analysis and hull cleanliness. By combining platforms into a single interface and leveraging the Internet of Things, Services and People (IoTSP), OCTOPUS assists ship officers and engineers in making real time decisions enabling them to be proactive in safety and efficiency actions, resulting in more immediate benefits than just traditional post voyage analysis. Details about the impact of external factors, such as weather, against the loading computer parameters and propulsion data can allow shore staff to assess the safety and full cost of future charters as well as providing suitable route options and delivery dates. Ashore, the historic voyage data can contribute to raising efficiency across a whole fleet by intelligent analytics. “For the first time we are bringing together two important features in the marine industry, energy efficiency optimization and safe voyage execution, into the same software and analytics platform,” said Mikko Lepistö, Senior Vice President of Vessel Information and Control. “One of the advantages of OCTOPUS is that it is scalable, meaning it can be adapted for vessels depending on the complexity. One aspect that remains largely unchanged for ABB’s marine software across vessel types is the short payback, which is around one year.